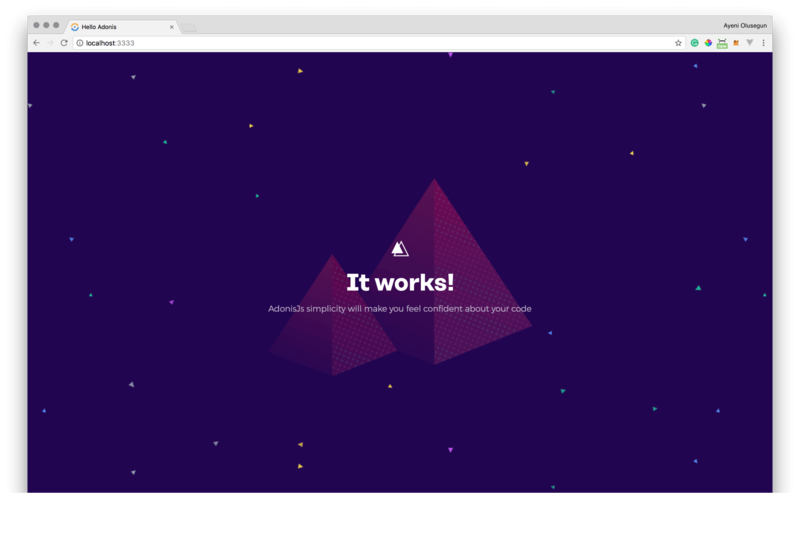 Adonis is a full stack, open source MVC framework for Node.js. The framework is inspired by the PHP framework Laravel. As at the time of this tutorial, it has over 2.8k stars on GitHub. Adonis has very detailed documentation and a supportive community of users who are engaging on Gitter and Twitter. In this tutorial we are going to see some of the interesting features of Adonis by building an app that pushes realtime messages to all connected clients using Pusher. <input type="text" name="message" placeholder="Send Messege"
We are going to define 3 basic routes for our application. One for displaying the form which you will use to collect the user message, another to render a sample frontend view and the last for broadcasting a messages via Event. The block pulls in Event and Route service providers. The first route renders the welcome.edge file in the resources/views directory (which is where views are stored in Adonis). The second route renders the home.edge file (which we will create soon) and the last route accepts a message from browser requests, fires an event and redirects the user back with a flash message. Pusher is a hosted service that makes it super-easy to add realtime data and functionality to web and mobile applications. Pusher is an abstracted real-time layer between clients and servers. Let's setup pusher for our application. Head over to Pusher and create an account. You can sign in if you already have a account. We need to pull in the Event and env service providers. We are also importing the pusher module. Next, we create a Pusher instance and configured with the credentials that were received after creating a Pusher account. Next, we registered a listener for the send.message event, after which we initialize and configure Pusher. This event was registered in the routes we created above to handle the message request. When we are done with the pusher configuration, we trigger a send-message event on the adonis-channel with the trigger method. Next, we initialize the Pusher service by passing in our App Key (replace with your actual keys), and some other options (cluster, encrypted). The initialized instance is used to subscribe to the adonis-channel channel. 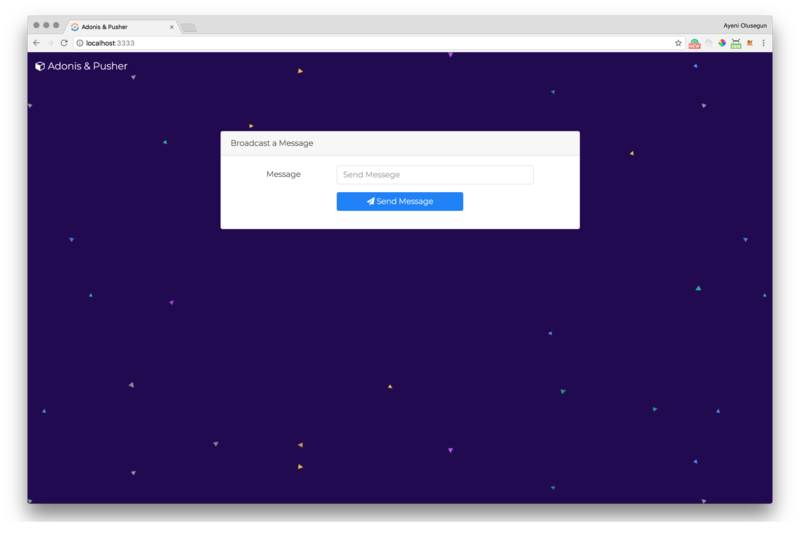 Finally, we listen to the send-message event and update the view using jQuery, based on the content received via the event listener. 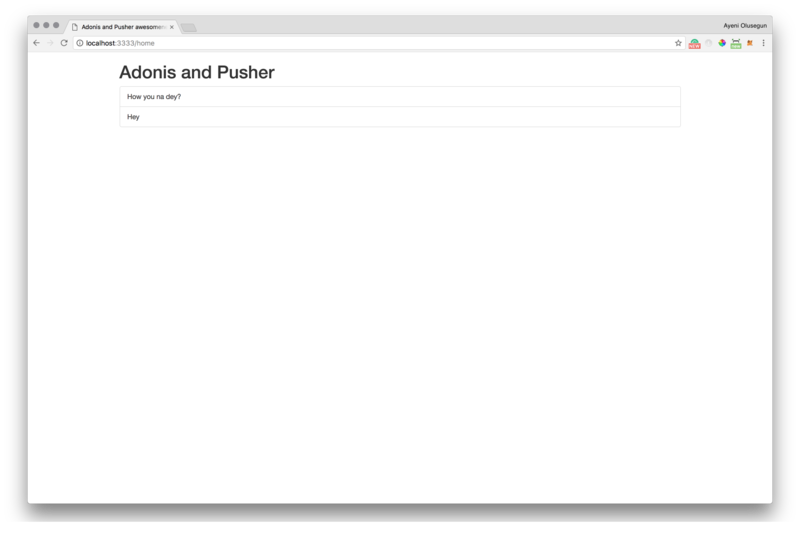 In summary, Pusher makes it easy to add realtime capabilities to your Adonis app. Install the SDK, import it, create an instance and start triggering realtime events. Whatever language domain (JS, Android, iOS, etc) it still uses the same subscription pattern to listen to realtime events in order to update a user interface. This is why it fits right into the Adonis framework, which is picking up momentum in the Node ecosystem. You can find the source code for this tutorial on GitHub.